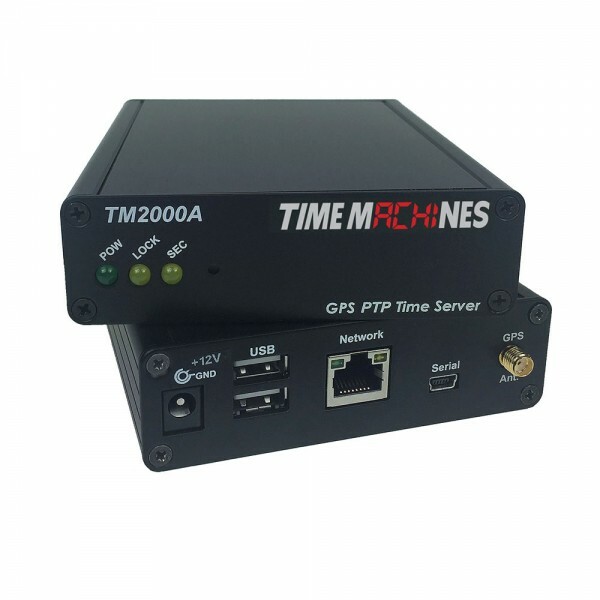 The TimeMachines GPS NTP/PTP Network Time Server represents a major step forward in capabilities at a breakthrough price point. It will supply accurate time for all computers and time keeping devices on the network. Supporting both Precision Time Protocol (PTP) and Network Time Protocol (NTP), a Stratum 1 time source can now be available on the local network with no need for an internet connection. The system uses an active GPS antenna to maintain the current time as broadcast by GPS satellites planet wide. In addition, a high stability OCXO reference clock is included that allows the unit to serve time if GPS lock is lost for periods of time. The unit is small and can be placed anywhere within the network layout. The built in high sensitivity GPS receiver is able to lock multiple satellites from within many buildings or from a window location, removing the requirement that outdoor antennas be installed in many applications. Until now, a PTP capable time server started with at $5000 and went up from there. The TM2000A provides both Multicast and Unicast PTP protocols to up to 50+ devices. Its high precision reference clock allows for several hours of GPS signal loss. • Holdover time: PTP: 2+ hrs NTP: 24+ hrs or better than 0.1 seconds over a year. • Unit is capable of serving 135+ NTP synchronisations per second. That provides support for over 120,000+ devices updating every 15 minutes on the network. • Active Patch GPS antenna included. Magnetic base. Cable: RG174, 5m length, SMA male. • Power Requirements: 5W at startup and 2.5W continuous at 12V DC. • Environmental Requirements: Commercial temperature range, 0-70C, 95% humidity non-condensing. Altitude -304m to 18,000m. • Networking: Static or DHCP IPv4 addressing. Standard browser interface for setup. • Serial port supports both RS-232C levels and TTL (+3.3V) outputting standard NMEA information strings, as well as the 1PPS signal at TTL levels. TTL signals can be turned off via software control. • Rear Connections: Power, Cat5 Ethernet, Serial, dual USB, and GPS antenna via SMA connection. Supports +3.3V and 5V active GPS antennas with internal jumper setting.